Rise Gold Corp has purchased the Idaho-Maryland Gold Mine (the “I-M Mine”) located near Grass Valley, California, USA. The I-M Mine is a major past producing high grade gold mine. The acquisition represents the exercise of the Company’s option to purchase the I-M Mine first referenced in the Company’s news release dated October 6, 2016. Based on historic records, the I-M Mine produced a total of 2.4M oz gold at a grade of 15g/t after mining dilution and recovery. The I-M Mine was reportedly the second largest gold mine in the United States in 1941, (1) producing up to 129,000 oz gold per year (2) before being forced to shut down by the U.S. government in 1942. At that time, the government deemed gold mining as non-essential to wartime production and shut down almost all gold mines in order to reallocate miners, equipment, and supplies to increase production of base metals necessary for the war effort. The Company has purchased fee simple land upon which the I-M Mine is situated, which includes approximately 93 acres of surface land and approximately 2,750 acres of mineral rights, for a purchase price of US$2,000,000. The Property includes all of the mineral rights assembled by Errol MacBoyle, a highly regarded mining engineer and a then-prominent mining executive in the United States, and the Idaho Maryland Mines Corporation (“IMMC”) over a thirty-year period from 1920. The Property includes the surface rights at the Brunswick vertical shaft, which extends to over 3,000 ft depth and was the main production shaft for the historic mining operation. The Company owns a 100% interest in the Property and there are no royalties on future gold production. The I-M Mine was a profitable operation before the forced closure in 1942. In the period from 1937 to 1941 the all-in cost of mining averaged ~US$24 per oz (3). The I-M Mine was known for having mineralized veins with remarkable continuity. A single vein, the Eureka Vein, produced ~1M oz gold at a grade of 34g/t after dilution and recovery. The Eureka Vein was continuously mined from surface over a pitch length of 1.6km with strike lengths from 150m-300m. Metallurgical recovery during the late years of production was high and ranged from 94-97% gold recovery. (4) Approximately 65% of gold was recovered by gravity processes with the remainder recovered by flotation. The I-M Mine reached production of 129,000 oz gold per year in 1940 (5) before it was ordered to be shut down by the U.S. government in 1942 due to the onset of World War II. In 1942, just prior to the wartime shutdown, Mr. MacBoyle had completed the installation of a brand new headframe and hoist, crushing plant, and complete refit of the processing plant in order to increase production to 2,000 tons per day (6) which would have allowed production of approximately 240,000 oz gold per year. The I-M Mine was restarted on a commercial basis in 1946 but production was severely impacted by lack of working capital. Prior to the shutdown, from 1936 to 1942, over 96% of post-tax income was reportedly paid out to shareholders as dividends. 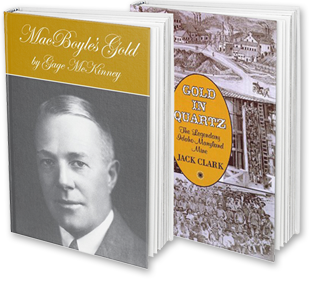 (7) MacBoyle suffered a serious stroke in 1943 and was left partially paralyzed and unable to speak. Proxy battles and dissent among members of the board of directors of IMMC compounded the leadership crisis initiated by MacBoyle’s illness which led to his death in 1949. High inflation of costs after World War II, in conjunction with the fixed price of gold at US$35 per oz, resulted in the cessation of gold production at the I-M Mine in 1954. Due to the circumstances under which the I-M Mine was shut down, the Company believes there is significant potential for additional gold resources left unmined in the existing workings and exploration potential to expand the mineral resources below the historic mine workings. Included in the sale of the Property are the complete historic records of the I-M Mine. The comprehensive records include thousands of documents and maps which show mine workings, production data, drill results, assays, and other important information.Approximately 70,000 meters of core drilling and 36,000 assays were completed by IMMC. Historic drill results in unmined areas include assay composites of 16g/t gold over 9m and 6g/t gold over 17m. Chip samples taken in unmined areas range up to 1,375g/t Au (40oz/ton gold). (8) Emgold Mining Corporation held an option on the I-M Mine Property from approximately 1991 to 2013 and completed a mineral resource calculation which is displayed in Table 1. The Company believes this historic resource estimate is relevant but the Company has not verified the mineral resource calculation. A full analysis of all historic production and sampling data will be required in order to verify the historic mineral resource. Historic Mineral Resource for Idaho-Maryland Gold Mine reported by Emgold Mining Corporation on November 1st 2002 in a report titled “Idaho-Maryland Mine Technical Report" authored by AMEC E&C Services, S.J. Juras, P.Geo and S.K.. Morris, P.Geo, Mineral Resource is stated at a 3g/t gold cut-off grade. AMEC used mineral resource categories which are consistent with current NI 43-101 disclosure requirements. Rise purchases Idaho-Maryland Gold Mine with 100% Ownership. Total past production of 2.4M oz gold at 15g/t after dilution and recovery. Production reached 129,000 oz gold per year in 1940 before forced shutdown for WWII. Significant historic mineral resource calculation by previous operator. U.S. Bureau of Mines. Minerals Yearbook 1941 (1942). Pg.252. AMEC E&C Services Limited (AMEC). Idaho-Maryland Mine Technical Report (2002). U.S. Bureau of Mines. Minerals Yearbook 1942 (1943). Pg.288.